A lot of Disney DVD releases, particularly the newest, have some very difficult copy protection on them, which makes the Disney DVD appear way oversized and ripping unavailable. You may have MacTheRipper but it produces output movie files with over 100 GB each. Okay, handbrake exists. But when you use it to rip Disney DVD on Mac, its ripping process gets frozen for any reason and you can't even eject your discs. Quite maddening, right? Calm down. There is a simple solution to help you out of this Disney DVD ripping trouble. That is - VideoProc, which is constantly upgraded to bypass the new Disney DVD copy protection and 1:1 copy Disney movies on Mac. Additionally, it still works to remove protections of recently released DVD movies, 99-title DVDs, TV series DVDs, workout DVDs, and other damaged or unplayable DVDs. Enjoy FREE upgrades to future version. 30-day money back guarantee. Bypass all DVD copy protection like Disney DRM, Sony ARccOS, CSS, UOP, etc. Copy Disney DVD to iPhone X/8 Plus, Galaxy S8, Xperia XZ etc mobile devices. (Hardware acceleration) 5 minutes to rip Disney DVD to MP4, MKV, MOV etc. To explore the list above of the latest DVD movies produced and/or released by Walt Disney Productions, the new Disney DVDs are hard to decrypt or copy because Disney company adopts new X-project protection schemes that's preventing the rip. Generally, the DVDs wrapped in Disney encryption algorithm come with 99 titles that many software are failed to select right one. Now, you can use VideoProc to remove 99 titles DRM protection of Disney movies such as The Incredibles 2, Avengers: Infinity War, Ant-Man and the Wasp, back up DVD movies A Wrinkle in Time, Star Wars, Coco etc. It shall be noted that we hope you will use this DVD ripper for Disney DVD with respects to the copyright law and will make only legal copies. Please comply with your local DVD copyright law and apply the DVD contents for fair use. Disclaimer: Before ripping Disney DVD movies, please make sure you have full copyrights of your DVD and backup the encrypted DVD for fair use. Don't use it to break the DVD copyright law. Here we will show you how to get started with VideoProc! You will see, with this top-rated DVD decrypter yet ripper, you can decrypt and make backup of your favorite Disney DVD movies to MP4, H.264, MKV, MPEG, FLV, AVI or other video format you preferred. Additionally, you are also allowed to transfer DVDs to iPhone, iPad, Android devices with only a few clicks. To rip Disney DVD, the first thing you need to do is to free download VideoProc; fire it up and insert the Disney DVD disc. Then click on the DVD icon on the main interface to get ready for DVD ripping. You can load from DVD driver by clicking "DVD Disc" or from DVD folder, DVD ISO image file. After completing movie content loading, this Disney DVD ripper software will analyze your disc and display all the available segments. It will also automatically choose the recommended title to rip. The title in this tutorial is just an example. Tips: If this DVD ripping software can't select the title correctly, or the segment recommended by this app could not be converted smoothly, please go to the optional step listed below. Tips to Find The Title Number by Using DVD Player (Optional): Play the DVD movie with DVD player software. When it comes to main content of the movie, please check the DVD title and record the title number. After VideoProc launched, find the title number you've recorded and tick it. To rip Disney DVD Finding Dory, you're suggested to use the DVD player to select DVD title first. After DVD importing, select the output video or audio format you desire from the buttom column of the windows, with all common video formats and devices. Or you can also tap the Target Format icon to choose from more preset profiles. 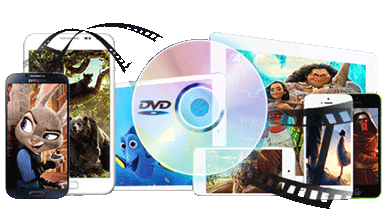 You could choose to copy Disney DVD to ISO image, MPEG file with main/full title, MP4, FLV, AVI, MPEG, MOV, iPhone, iPad, iPod, Samsung, HTC, WP8, Surface etc. 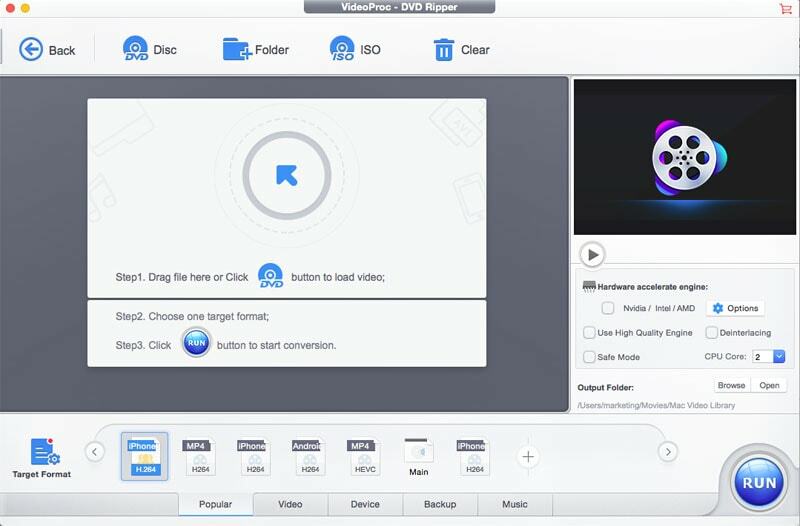 Tips: If you want to customize video or adjust the parameters for your devices, VideoProc offers multiple options for you to make personalized videos as you desired, including crop, cut, merge, subtitles, rotate, effects etc. Step 3: Start Disney DVD Ripping. Specify an output folder by clicking the "Browse" button. Then tap the "RUN" button to start decrypt Disney copy protection and rip Disney DVDs on Mac. With the support of Intel QSV/Nvidia/AMD hardware acceleration, and multi-core CPU utility, the DVD ripping process will be accomplished at 250-320FPS, 5 times faster than any others. VideoProc is an all-in-one DVD decryption program to bypass the copyright protection of X-project DRM which is widely applied by Disney, Paramount and Warner. 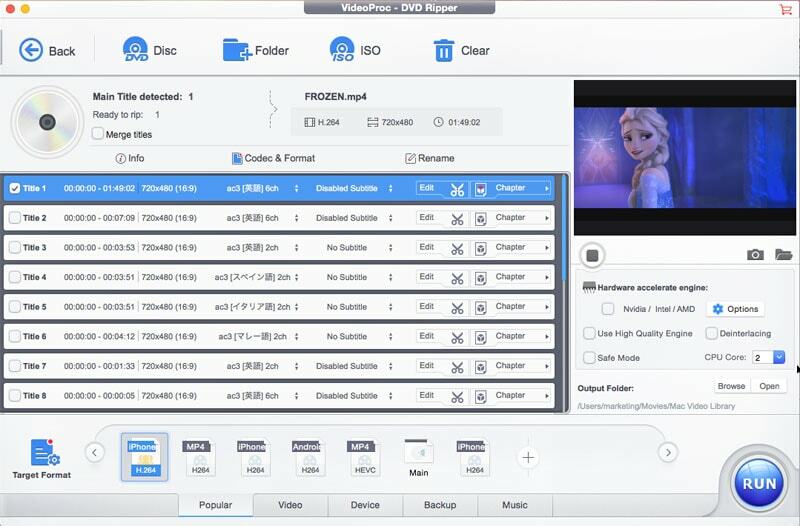 With it, you're able to rip Disney DVDs to al general-purpose video formats as well as 1:1 backup DVD copyies. Why not free download and register it to have a try?